Kim is a self-identifying “fabulous husky gaysian” comedian born living in Chicago. 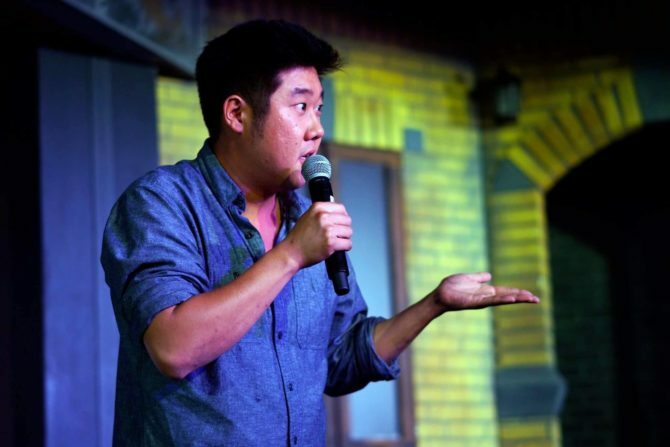 He’s appeared at Second City, Laugh Factory, and on The Moth, and has recently started using his platform to tackle the issue of racism among gay men, specifically racism directed at Asian men. Last month, he recorded a PSA about it for PBS. QUEERTY: How often do people ask you where your from and how do you respond? KIM: I was born in Flushing, Queens and have never been to Korea, but because of the way my face looks, I am charged with answering for my Korean-ness, instead of being an American human that just happens to not be white. It’s absurd because it’s just another little way white people make sure Asians feel like second class citizens. My favorite is when they find out that I’m Korean and they ask “North or South?” I always say “North” and blankly stare at them until their faces contort and explode with shame. What are some of the most annoying misconceptions you’ve heard about gay Asian men? You can call it what you want, but it’s straight up disrespect and I’m not having any of it. People think they can be casually racist to Asians and it be totally OK because you don’t see us clapping back. Well, here’s me clapping back: If you’ve never asked yourself why you prefer what you prefer, then you might as well be cattle. Idiots who say “No Asians” are the same trash gays who say “No Fats, No Fems, Masc only” and other basic Grindr sh*t like that. It’s usually white gays (surprise!) that are enslaved to the heteronormative notions of shaming femininity and praising masculinity, which is insane because, hello, WE ARE GAY! You’re dating a white guy from Minnesota (where I’m from, BTW!). Have you experienced any challenges being an interracial couple? Firstly, congrats on being from Minnesota. I’ve traveled all around the Midwest, and you guys seem to be doing the whole “white thing” right. I’ve had the best time meeting my boyfriend’s family and friends in Minneapolis. People seem to be woke, without being self-congratulatory, which is a difficult balance to achieve. Frankly, the only roadblock we’ve faced is from my mother, who is lovely but does not speak a lick of English, and she’s been an American for 35 years. I guess she figured that I’d learn it, make a bunch of money, then take care of her... So I guess what I’m trying to say is that she better get hooked on some phonics, quick. How do we, the LGBTQ community, begin to tackle the issue of white supremacy in our culture? We must tackle white supremacy in our culture by learning from the mistakes of white feminists. We must wake up and stand up for all oppressed groups, intersectionally, starting with women. If sexism and male supremacy is not fixed first, then we have no hope for anything else because oppression trickles down. The abused turn around and abuse those more vulnerable, quickly forgetting the lessons we’ve learned. Especially during a volatile and confusing time under our current administration, we must all band together and fight hate and fear as a united front. And I think the way to do that is through more communication and exposure. If you care for someone who is a gay Asian man or trans Latina woman or a Black bisexual, you’re more inclined to use your vote to protect them from institutionalized hate. Privilege, in all its forms and in itself is not a bad thing. We are all more privileged than others in different ways. It’s how we decide to engage with it that defines our character. Some people are so willing to believe that they are the victims of their story that they choose to be willfully ignorant of how much better they have it than so many others in our country, much less the world. It’s not a crime to be privileged, but it is criminal to ignore the existence of it.